Can you believe it? Randy has never been to Canada's Maritime Provinces! Yet we've traveled by RV all the way to California and many points in the USA many times over. As proud Canadian's that's almost embarrassing! But this is finally the year! We have just started the five-week road trip we've been planning for four years. Or I should say, "loosely planning". Our agenda is open to anything! 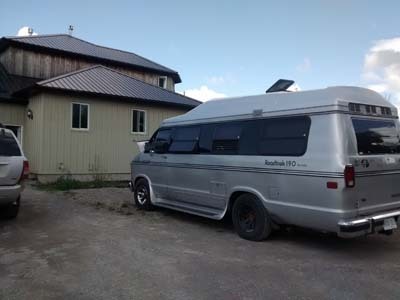 Unless a whim or fancy steers us off course, we'll drive the coastline of the Gaspe Peninsula, cross through New Brunswick, to Prince Edward Island, and around the Nova Scotia Mainland. Cape Breton is also on our bucket list. Neither of us has been there and it's supposed to be remarkably beautiful. Whether we make it there, will depend on how slowly we meander and how tempted we are to do an extra hike or two, or just sit still to enjoy the view. Everyone also asks whether we'll include Newfoundland; While it's also on our Bucket List, there won't be time. We'll definitely save that province for a future trip. 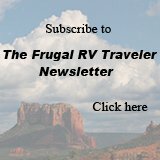 Campgrounds, Boondocking, or Other Camping Options? We've been promising ourselves this trip for the past four years. A combination of factors saw us cancelling those plans, never because of cost but for other reasons. This summer another set of factors has played into our hands: Our Canadian dollar remains quite low compared to the US dollar, the price of fuel remains low (only slightly more expensive here than in the US if you factor in the exchange), Canadian and US borders are sharing information now which means we can't be in The States for more than six months per year without tax consequences and, we now have a lot of Boondockers Welcome hosts across Canada. 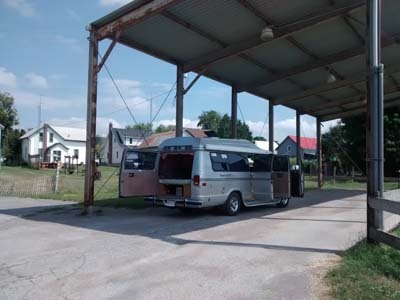 Between stopping to visit friends, making new ones (through Boondockers Welcome), using some of the other free and discount services we subscribe to (Days End, Harvest Hosts, Passport America) we hope to keep our camping expenses low. 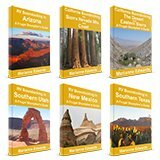 We have not done a a lot of research so, if any of you have done a similar trip and have some "must see" lesser-known attractions that we should not miss, please let us know about them. Our first lunch stop. Extreme heat on departure day but we found shade. We were very proud of ourselves for avoiding expressways entirely on day one. 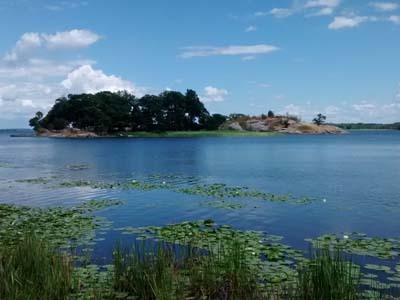 Day two - The Thousand Islands Parkway, a scenic route, was a nice break from"The 401"(Expressway). Our destination near the Ontario/Quebec border was a very special treat. Rachel Berryman and I finally met in person! Rachel has been diligently translating my Frugal shunpiker's Guides into into French for the past six years. 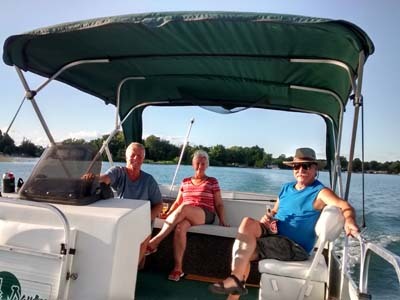 She and her husband, Denis, treated us to a boat ride and a great dinner, including regional French Canadian specialties such as grillades (spiced) bacon done on the barbecue and delicious local cheeses. What a wonderful evening! Day three we drove right through Montreal, crossed the bridge of the St. Lawrence River and again chose the slower, more scenic route. 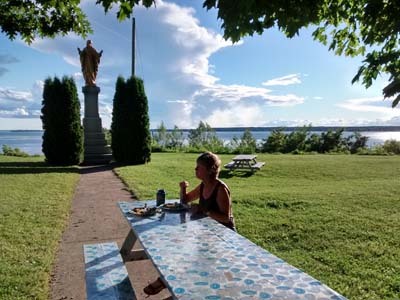 We followed the "Rue des Navigateurs" (Hwy 132), getting our first taste of this provinces' picturesque villages and scenic landscapes and stopping for dinner at one of the many picnic areas along the river. 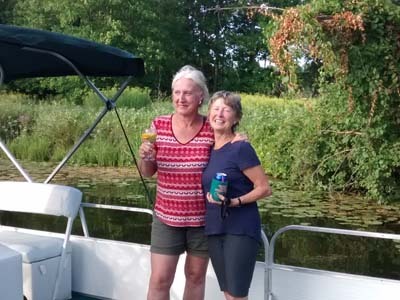 Dinner by the St Lawrence"
Our final destination was just south of Quebec City where we received a warm welcome from our Boondockers Welcome host, Patricia. 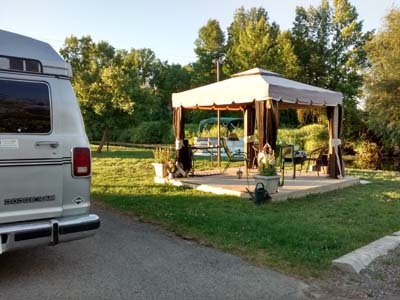 She had picked up local brochures and maps, told us about her favorite stops in the Gaspesie area, gave us great advice for seeing Quebec City, and directions to the free RV dump in her village. A few things we're sure thankful for that we hadn't really thought about in advance: We managed to time our visit perfectly with the end of the Quebec Construction Holiday (something we didn't know anything about but we found out it means that those two weeks the parks, beaches, etc. in the province are extra busy.) The French Canadians we've met so far are super patient with our poor French language skills and most of them do speak English. We've never been more grateful to have our GPS; she speaks to us in English even when the street signs are all in French (even though her pronunciation of the French words is horrendous!). Our Maritime adventure is off to a perfect start. Hope you'll continue to follow along! Sounds like a wonderful plan. I will be an avid reader. I have never been east either and would love to go on the next 2 years.